# What is this textbook?This is a lecture on coding and creating apps and games that can be installed and run on Android phones.This is a lecture that will be helpful to everyone from performance evaluation of middle school and high school students to job seekers who want to become a professional programmer.You can study the theory, practice, and development of your apps at the same time and have fun coding.You can also create your own apps and install them on your phone.# Why should I learn coding?The purpose of learning coding is to improve the ability to think logically. Making a command to a computer is a lot different from talking to a person. Because the computer can understand only computer programming language.# Do ordinary people who do not care about coding have to learn coding?Talking to a computer is a lot of patience, but if you have exactly delivered the command, it will be done. People make mistakes, but computers do not make mistakes. The Alpha Go’s movement, which looked like a mistake in the match with Lee Sedol in March 2016, was actually a thoroughly calculated strategy.In this sense, it is helpful for ordinary people to learn coding to live their life.# So how do I study to learn coding?No matter what kind of discipline, practice is important.Knowing only coding theory does not help you to grow your logic. Repeatedly doing many exercises will improve your ability to think.The human brain is similar to muscles. Muscle should continue exercise to develop further. When weighing in a gym, muscles grow, and astronauts who travel on a car have less muscle. Likewise, if you want to develop your brain, you should do a lot of thinking exercises.That is why theories should be learned at a minimum and lots of practice are better.If you make many examples in this manual, you can understand what the coding grammar means. You can naturally improve your logic while making various examples.# Is not coding useful in real life just educational?It is worth studying just to improve the logic, but it would be better if it helps the real life. Currently, the most common tool for coding is scratch. This textbook is a little different. 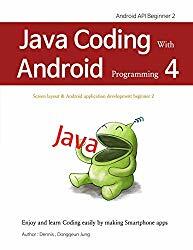 In this tutorial you will develop various Android apps by Java language. You can study coding, create your own apps, and install them on your smartphone. Also, if you want to become a programmer like the author, you can learn the real IT techniques.# Should studying be boring and difficult?There are a lot of people who think that study hard makes good memory. I do not mean to say wrong, but if I study it, I think learning to have fun makes feel easy and concentration is higher. Maybe you have heard this sentence? 'A genius can not follow a hard worker, and a hard worker can not follow who enjoy he’s work. 'This tutorial will help you learn coding and smartphone application development by making simple games and apps.# Why do I have to learn the Java language among various computer languages?Among many computer languages, the C series takes up 50 percent of the market. C, C++, C#, and Java are C series languages. That's why learning the Java language is like learning C and C++. Scratch or Python is easy to learn, but after learning an easy langue you may feel difficult to learn other languages. The C series language is difficult to learn at first, but after you get used to it, you can easily learn other languages.# I don’t know anything about coding. Is it difficult to develop an Android application?I made this book even beginners can study alone, and develop smartphone apps. As you read and practice making sample apps through the textbook, you will find yourself becoming an expert.